A 3D-printed, painted model of a "Star Trek Online" Pathfinder ship. "Star Trek Online" players can put a lot of time into choosing, outfitting and customizing their starships, and now that work can follow them into the real world — with hand-painted 3D-printed starships based on their exact designs. Perfect World Entertainment Inc., the owner of the free massively multiplayer online game, announced on Feb. 20 that 3D-printed versions of nearly every starship available in the game will be available starting in March, in partnership with the San Francisco-based company Mixed Dimensions. The starships will be uploaded directly from the PC version of the game into the company's GamePrint website for production. A 3D-printed model of the Pathfinder, primed so it can be painted at home. "We are absolutely elated to expand 'Star Trek Online' to the physical universe," Stephen Ricossa, executive producer for "Star Trek Online," said in a statement. "Our new partnership with Mixed Dimensions will allow our community to immortalize their favorite starships. We can't wait to see the reaction from our captains when the first wave of ships begin to roll out. More than 500 starships are available in "Star Trek Online," according to the statement, many from "Star Trek" shows such as "Star Trek: The Original Series," "Star Trek: Enterprise" and "Star Trek: Deep Space Nine," as well as "Star Trek" movies. Another view of the 3D-printed, painted Pathfinder. 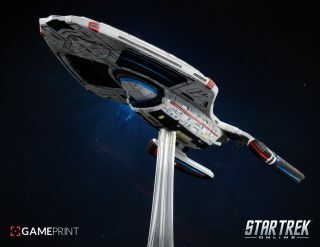 Players can choose either a hand-painted, 12-inch (30 centimeter) resin collectable version of the ship, a single-color version or a primed version, which the player can paint at home. The Pathfinder as it appears in "Star Trek Online." Twenty of the most popular "Star Trek Online" ships will also be available as completed models, without the customization.